Generally known as “learning styles”, it is the belief that individuals can benefit from receiving information in their preferred format, based on a self-report questionnaire. This belief has much intuitive appeal because individuals are better at some things than others and ultimately there may be a brain basis for these differences. Learning styles promises to optimize education by tailoring materials to match the individual’s preferred mode of sensory information processing. There are, however, a number of problems with the learning styles approach. First, there is no coherent framework of preferred learning styles. Usually, individuals are categorised into one of three preferred styles of auditory, visual or kinesthetic learners based on self-reports. One study found that there were more than 70 different models of learning styles including among others, “left v right brain,” “holistic v serialists,” “verbalisers v visualisers” and so on. The second problem is that categorising individuals can lead to the assumption of fixed or rigid learning style, which can impair motivation to apply oneself or adapt. Finally, and most damning, is that there have been systematic studies of the effectiveness of learning styles that have consistently found either no evidence or very weak evidence to support the hypothesis that matching or “meshing” material in the appropriate format to an individual’s learning style is selectively more effective for educational attainment. Students will improve if they think about how they learn but not because material is matched to their supposed learning style. The Educational Endowment Foundation in the UK has concluded that learning styles is “Low impact for very low cost, based on limited evidence”. Conditions of learning, Robert Gagne. In InstructionalDesign.org. Full text available here/ For more click here or here or search: Gagne, R. (1985). The Conditions of Learning (4th.). New York: Holt, Rinehart & Winston. According to Kuhn, he discovered incommensurability as a graduate student in the mid to late 1940s while struggling with what appeared to be nonsensical passages in Aristotelian physics(…) He could not believe that someone as extraordinary as Aristotle could have written them. Eventually patterns in the disconcerting passages began to emerge, and then all at once, the text made sense to him: a Gestalt switch that resulted when he changed the meanings of some of the central terms. He saw this process of meaning changing as a method of historical recovery. He realized that in his earlier encounters, he had been projecting contemporary meanings back into his historical sources (Whiggish history), and that he would need to peel them away in order to remove the distortion and understand the Aristotelian system in its own right (hermeneutic history) (…) Kuhn realized that these sorts of conceptual differences indicated breaks between different modes of thought, and he suspected that such breaks must be significant both for the nature of knowledge, and for the sense in which the development of knowledge can be said to make progress. Kuhn was influenced by the bacteriologist Ludwik Fleck who used the term to describe the differences between ‘medical thinking’ and ‘scientific thinking’ and Gestalt psychology, especially as developed by Wolfgang Köhler. Niklas Luhmann-Social Systems Theory: distinction between system and environment (inside/outside)/ it is the communications between people not people themselves, they are outside the system/ our thoughts make no difference to society unless they are communicated/ systems communicate about their environments, not with them/ the environment is what the system cannot control/ systems relate to the environment as information and as a resource/ society-encounters-organizations: the three types of social systems. Society: is an autopoietic system whose elements are communicative events reproducing other communicative events/ this communication has content and relationship levels: what is communicated and how/ all communication is both communication and communication about communication/ communication is imaginary/ communication takes place when an observer infers that one possible behaviour has been selected to express one possible message or idea/ the meaning of the message is always inferred by the observer. Def. Feature 01: Use of Self-Regulated Learning Strategies_SR Learners have an awareness of strategic relations between regulatory processes or responses and learning outcomes and they use these strategies to achieve their academic goals. 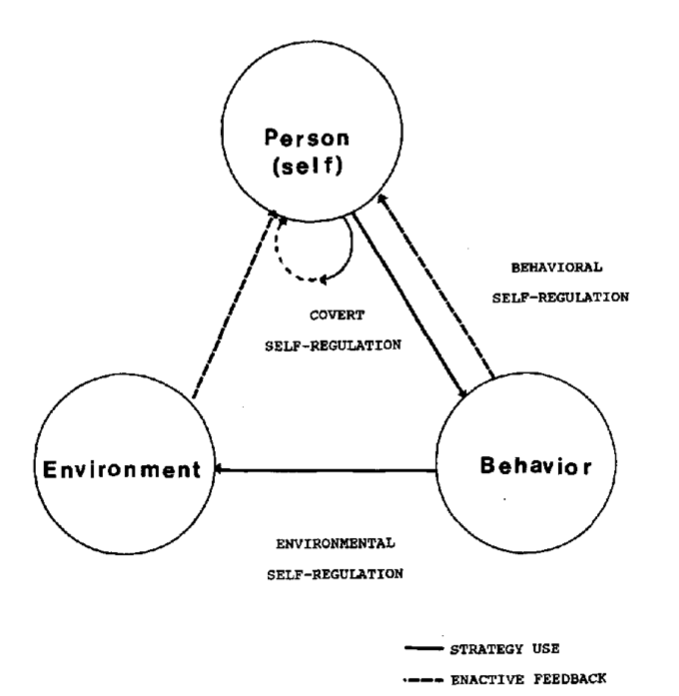 The image illustrated above represents the triadic reciprocality, a proposed view of self-regulated learning that assumes reciprocal causation among three influence processes. According to social cognitive theorists, SR Learning is not determined merely by personal processes but also environmental and behavioral events in a reciprocal fashion. According to Bandura, these are not necessarily symmetrical.